Thomas Hobson bolted up in the Ascot Stakes for the formidable combination of trainer Willie Mullins and jockey Ryan Moore. The pair had teamed up to land the prize with Simenon (2012) and Clondaw Warrior (2015) in recent years and Thomas Hobson was the 4-1 favourite to follow suit. Moore was ultra-confident aboard the seven-year-old and remained nearer last than first turning for home. But he arrived on the scene still full of running with two furlongs to run and once given his head he extended clear for an impressive success. Endless Acres was best of the rest in second, ahead of Alan King's pair of Who Dares Wins and Rainbow Dreamer in third and fourth respectively. 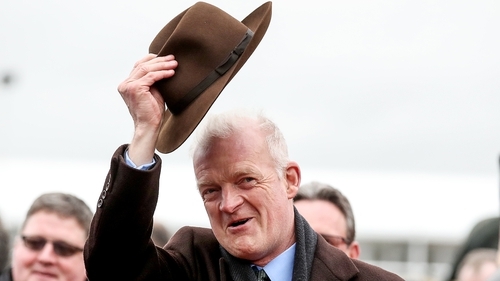 Mullins said: "Ryan was just super on him, wasn't he? He obviously had a clock working in his head today. It's fantastic. "I think we'd like to go to Melbourne (Cup) with him, that's the end game. To have a winner at a Festival like this is magic, as good as Cheltenham any day of the week." Mullins said: "We won't have many runners this week as I'm worried about the ground. We'll see how he comes out of it, if he'll run on Saturday (Queen Alexandra Stakes). "That was a track record and we'll see how the horse is, John Gosden said he didn't enjoy fast ground when he was younger but he's more mature and might handle it better." Owner Rich Ricci said: "This beats November when I'm normally here. There's sunshine, the Queen is here, it's remarkable. Willie is great, the horse was great and it was great to have Ryan. This isn't my game, but it's great to be a part of it." Charlie Fellowes said of the runner-up: "He's run his heart out. He's had a really hard race, he won't run on Saturday and he'll have a break. We'll look at something in the autumn before going for the Cesarewitch."